You hear it all the time on golf courses….I need to slow my swing down. Maybe you’ve even said that yourself. Well, unless you swing at 160 mph and are spraying it all over the place you don’t need to slow your swing down….ever! You may need better timing. You may need better rhythm and tempo, but I bet my house on the fact that you will not need to slow your swing down. I think T.V. has caused this big problem, because when you see a pro swing on T.V. it looks slow and smooth. But what you’re watching is not reality. It’s like watching race cars on T.V. and thinking they look to be going quite slow. Then when you watch a professional golfer swing or a race car go around a track in person it looks fast. Now a great example is Fred Couples. His swing is so slow, smooth and easy right? Well, his swing speed is up to 123 mph. So he might have a smooth and easy swing but it’s very FAST! So you should swing smooth AND fast. That should be your goal if you want to hit longer drives. 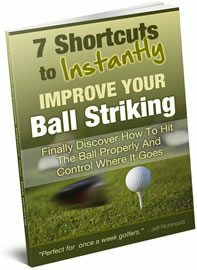 You should never try to swing slow unless you’re playing a little knock down shot into the wind and you want to reduce the backspin on the ball. The point of this article is to make sure that you NEVER say you need to slow down your swing. Take that word out of your golf vocabulary if you want longer drives. Instead say things like….I need better timing. Or, I need better sequencing in my swing. Or, I need better rhythm. If I hear you say you need to slow your swing down I’ll come and slap you around the ears. Got it?! One simple way to learn to swing faster is to simply turn your driver upside down so you grip it near the clubhead. Then swing it. If you get a swing speed radar like this one I recommend and you find that you’re not swinging at least 10% faster than your normal driver swing speed, then you’ve trained yourself to swing slow. Swinging something lighter than your normal golf club is a great way to train yourself to swing faster. The device must be about 10-20% lighter than your normal driver to get any benefit when you go to swing normally though. 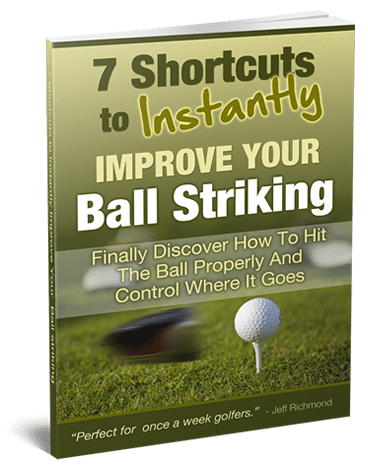 So go to it…train to speed up your golf swing and you’ll hit longer golf shots.